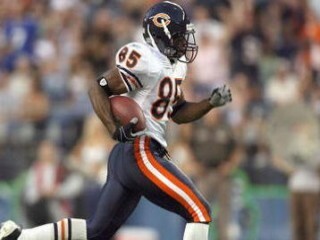 Earl Bennett is an American football wide receiver for the Chicago Bears of the National Football League. After moving into the starting lineup, has caught 54 passes for 717 yards (13.3 avg) and 2 TDs... Played in 26 career games, including 15 starts... Returned 14 punts for 143 yards (10.2 avg) and 1 TD and 2 kickoffs for 40 yards (20.0 avg)... Tallied 4 career special teams tackles. 2009 : Started 15 of the 16 games he appeared in, finishing second on Chicago with 717 receiving yards on 54 catches (13.3 avg)... Collected 2 TD receptions, including the first of his career vs. STL (12/6)... Returned 14 punts for 143 yards (10.2), including a 49-yard TD return at BAL (12/20), and 2 kickoffs for 40 yards... Made his first career start at GB (9/13). 2008 - Saw action in 10 games, including the final five contests... Returned 1 punt for 17 yards and added 4 special teams stops, including a career-high 3 stops vs. JAX (12/7). All-time leader in SEC history in receptions (236) three year career at Vanderbilt (2005-2007)... Named all-SEC all three years in college, taking home first-team honors as a sophomore and junior and second-team accolades as a freshman... Became the only player in SEC history to record 75 receptions or more in three seasons... Tied for 2nd in Commodore history with 20 TD catches... Ranked 3rd in Vanderbilt history and 9th in SEC history with 2,852 career receiving yards... Holds the school record for career receptions, receiving yards in a game (223 vs. Richmond, 2007), TD receptions in a game (5 vs. Kentucky, 2005), most games with 10 or more receptions (9) and most games with 200+ receiving yards (3)... Compiled three of the top five receiving performances in school history... Collected at least 1 reception in every game he played and notched at least 4 catches in 29-of-36 career contests, starting the final 32 of those games... Became just the fifth player in SEC history to tally 5 TD catches in a single game (vs. Kentucky). Started at WR, RB and CB at West End H.S. in Birmingham, AL where he was named first-team all-state by the Alabama Sports Writers Association... Also lettered in basketball... Son of Sarah Bennett and Earl Frison... Volunteered time to efforts aimed at helping local children in inner-city Birmingham community.